This issue’s cover illustration is from Finding Jennifer Jones by Anne Cassidy. Thanks to Hot Key Books for their help with this January cover and to Atom for their support of the Authorgraph interview with Keren David. By clicking here you can view, print or download the fully artworked Digital Edition of BfK 204 January 2014 . 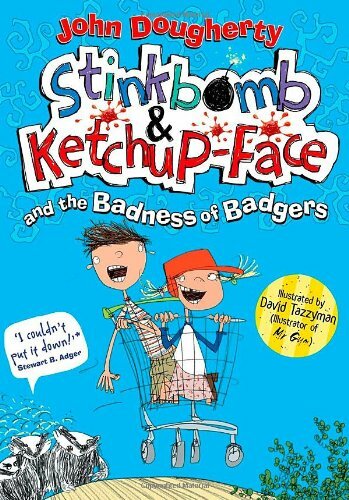 Meet Stinkbomb and Ketchup-Face, a brother and sister who live on the island of Great Kerfuffle. When Stinkbomb finds ten pounds missing from his piggy bank, they conclude that it must have been the badgers. And so starts a quest to visit King Toothbrush Weasel and rid the kingdom of badgers. Add a host of crazy characters, lots of singing about jam and a talking shopping trolley and you have all the ingredients for a riotous story certain to be enjoyed by boys and girls alike. This is a laugh-out-loud read, bursting with energy and anarchy, and packed with suitably zany black and white illustrations on most pages from the illustrator of Mr Gum. The anarchic humour will appeal to this age group, who will also ‘get’ the spoof literary conventions of quest stories, absent parents and chapter and sentence jokes. Funny, silly and thoroughly enjoyable: my seven-year old tester and I had many a laugh while reading this!